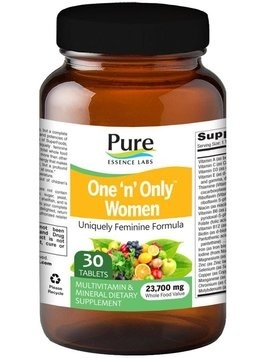 One ‘n’ Only™ Women is a nutritional support system formulated for women in reasonably good health who prefer taking just one tablet per day, but want added support for bone and breast health, and hormone balance. This is a form of folate that is usable as is by the body. The folate in many supplements is supplied as folic acid, which must be converted in the body by an enzymes to folate. It has been learned that many people lack this enzyme and thereby get no benefit from folic acid. The MTHF is already in food like folate form and does not have to be converted. It is vastly more expensive than folic acid, but a much, much better nutrient form. Vitamin was always thought to be present only in animals. Its sources as a supplement have been lamb’s wool or fish oil. It has now been found in a species of lichen, which is a moss like plant. This is a 100% vegan, whole food source, and highly preferable to the animal products that undergo many processing steps. Multiples are intended to provide supplementation of the vitamins and minerals your body needs, but might not get enough of in the diet. We believe that when it comes to multiples one size doesn’t fit all, which is why we have developed an array of formulas designed for different phases of life.